« I love to hate the Eagles. An interesting couple of video clips on the Hall of Fame. Hall of Fame measurements and an intro to the Class of 2008. Michael Irvin’s initiative to have rookies visit Canton. 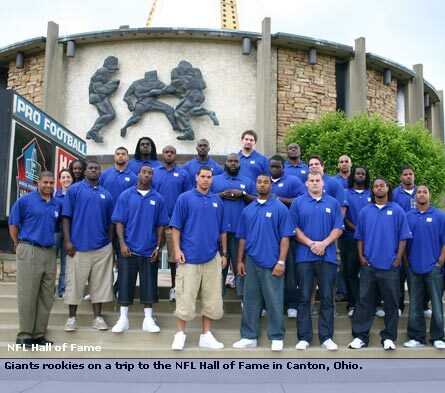 …and the Giants rookies visited Canton today. This entry was posted on June 20, 2008 at 10:39 am and is filed under Hall of Fame, Michael Irvin. You can follow any responses to this entry through the RSS 2.0 feed. You can leave a response, or trackback from your own site.